Known for its outstanding performance, vinyl siding is the exterior cladding of choice for homeowners, remodeling contractors, architects, and builders. Compared to other siding products, vinyl is attractive, durable, easy to maintain, and cost-effective. Vinyl siding is available in a variety of architectural styles, eye-catching colors, and design-enhancing profiles, finishes, and textures. To ensure proper quality, vinyl siding must meet or exceed the requirements of ASTM D3679 Standard Specification for Rigid Poly (VinylChloride) (PVC) Siding and other applicable standards from ASTM International, including those regarding color retention. As a service to the industry, the Vinyl Siding Institute (VSI) sponsors a program that allows manufacturers to certify, with independent, third-party verification, that their siding meets or exceeds this specification. The program covers vinyl siding, as well as polypropylene siding (certified to meet or exceed ASTM D7254) and insulated siding (certified to meet or exceed ASTM D7793). Insulated siding is a type of continuous insulation that provides a minimum R-value of R-2.0. Insulated siding is widely accepted in energy efficiency programs and is defined in the International Energy Conservation Code. For a listing of certified products, see the Certified Products page on VSI’s website. In addition, look for the appropriate certification labels on boxes of siding. This manual sets forth the basic guidelines for vinyl siding installation. The instructions herein are based, in part, on ASTM D4756 Standard Practice for Installation of Rigid Poly (VinylChloride) (PVC) Siding and Soffit, the standard method for installation of vinyl siding and soffit. Updated information has been added as necessary. Additionally, it is recommended that installers review local building codes and manufacturers’ literature for variations that may apply to specific products and/or geographic areas. The siding manufacturer’s specific product installation instructions should be followed in the event of a conflict with general industry practice or guidance. The method of applying vinyl siding and soffit is essentially the same for new construction and re-siding. However, where there are differences, special instructions for new construction and re-siding are included, as well as recommendations for historic restoration projects. In all applications, care should be exercised to properly prepare the structure. See the Basic Installation Rules and additional details throughout this manual for proper installation techniques. Polypropylene siding is an exterior cladding similar to vinyl siding; it should be installed according to the manufacturer’s instructions, as well as applicable local building codes in your area. 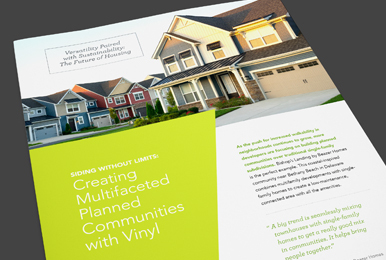 While this installation manual reflects generally accepted vinyl siding installation practices at the time of publication, because of continuing advances in design and materials, it is particularly important to check manufacturer literature and current building code requirements for your area.